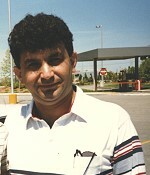 The 1997 unsolved homicide of Lorenc Marku. On March 14, 1997 at 10:22 p.m. Manchester Police responded to a call of a shooting that had just occurred in the south side parking lot of 241 Pine Street, Manchester, NH. Upon arrival, police found Lorenc Marku, age 36, suffering from multiple gunshot wounds. Witnesses at the scene only described the assailants as being two males wearing hoods. It was also learned that a white 1985 Oldsmobile Cutlass was possibly used as a get-away vehicle. This vehicle was later recovered in Warwick, RI. An extensive investigation that spanned several months, and included several trips to New York City was undertaken in an attempt to locate and identify the suspects.